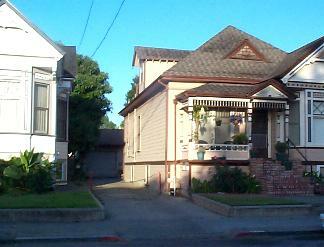 Our first location was in a garage behind a Victorian home in San Jose. We began manufacturing antique automotive parts for hobbyists. Our specialty was obsolete MG car parts for the T series MG. We had a catalog of items such as water pumps, oil pumps, clutch covers etc., all made in our shop. We had a world wide customer base of individuals and dealers. And, in valley tradition...we started in a garage! In 1980 we realized that larger quarters were necessary and moved to the Santa Clara location pictured below on the right. 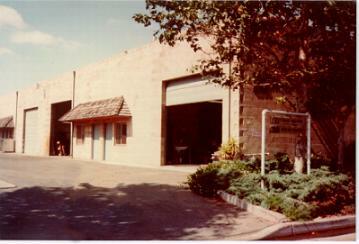 First, the unit next to the street, and later, in 1985, expanded into the next door unit as well. In 1982 we were asked to rebuild a faulty production line conveyor for Sperry Univac's Winchester Drive facility. The job called for designing, manufacturing and installation of new components. While on site, the engineers at Sperry asked us to build some tooling which lead us to discontinue the automotive parts. As the engineers and purchasing managers moved on to new companies they kept in touch with us. In 1984 some of the engineers from Sperry migrated to other disc drive companies and we bought our first CNC milling machine to produce production parts for a removable hard drive. In 1995 with five CNC milling machines occupying 2400sq-ft and a new lathe planned, we once again realized a move was necessary. Our current facility is pictured on our introductory page. Over the years we have manufactured for the communication, laser, microwave and medical industries. As our customers have acquired out of state and offshore facilities we are again shipping world wide.